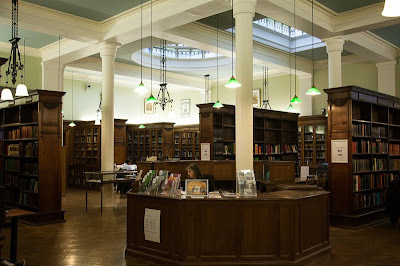 At a time when libraries seem to be out of fashion and closures the norm it was a treat to stumble upon a this Victorian gem. Bishopsgate library has an extensive resource on London's history, freethought, protest and the labour movement. It is funded by charities and free for anyone to use. Man alive! A proper library! No computers, kids and proper bookshelves. It opens my heart to see such a beautiful library. It is a real shame to close libraries. I wish I could spend hours, no, make that days, no, years in this place! Long may it remain. Beautiful place. I can almost smell the wonderful "book" smell. Wow, this just looks gorgeous. It reminds me of the old libraries at my university. It must be a great place to study in the long winter months. The two libraries in my town are packed all the time!!! I have given out your blog address to several people who are (soon) in London. I've been reading "Hitch 22" - a memoir by Christopher Hitchens in which he discusses his youthful days in English public schools and his years at Oxford and his love for libraries. I think he would have been right at home here! This is a beauty, Mo. Ah, now I understand why it seems like those nice libraries I used to enjoy so much. Let's hope the charities do not decide they want to make it an "information shop" or whatever. I assume you saw the little dolls-house-like dioramas there.